En español If you’re craving the kind of laid-back, all-American beach town that’s the antithesis of a gated resort with sleek hotel rooms, the following towns should more than satisfy. Think simple pleasures like saltwater taffy, wooden boardwalks and briny air — all yours, with lodging at prices that won’t break the bank, and public beaches that are priceless, in more ways than one. The easy charms of this Gulf Coast community don’t end with the white sand beaches and rosy sunsets. Every summer, hundreds of families make the pilgrimage here to partake in water sports of every stripe and to comb the wilds of Bon Secour National Wildlife Refuge (free admission). They also come to break bread with neighbors on backyard picnic tables laden with steamed shrimp and oysters pulled from the sparkling Gulf waters. Summer visitors may be lucky enough to experience a “jubilee,” strange occurrences of fish, crabs and other sea life that flop up onto the beach in droves on some nights when weather and water conditions combine just right. With a bohemian flair and 29 miles of sandy public beaches, Santa Cruz has the California vibe down pat. Head elsewhere if you’re looking for chilly minimalist resorts or formal restaurants — this beach resort town is the sunny seaside equivalent of a beanbag chair. 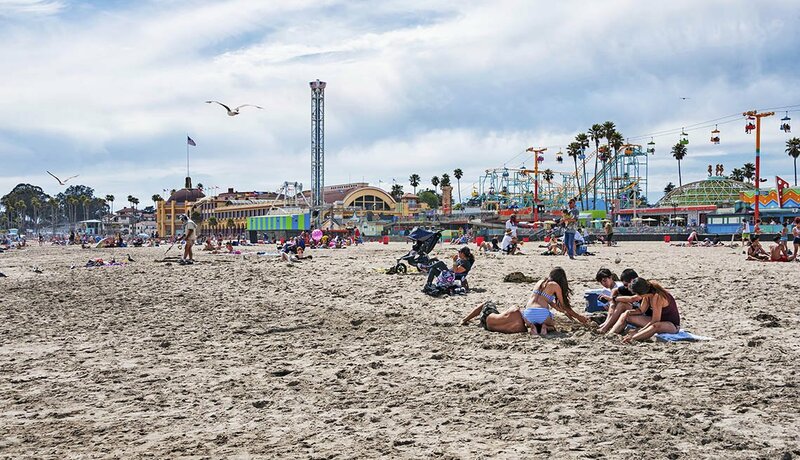 Hang out with the locals on the historic Santa Cruz Beach Boardwalk, which is a seaside amusement park with vintage rides like the Giant Dipper, a wooden roller coaster that’s been thrilling families since 1924. The park is adjacent to the Monterey Bay National Marine Sanctuary, where you may spy dolphins, sea lions or even a whale while braving the rides or dipping your toes in the surf. Kitty Hawk, Kill Devil Hills and Nags Head, N.C. 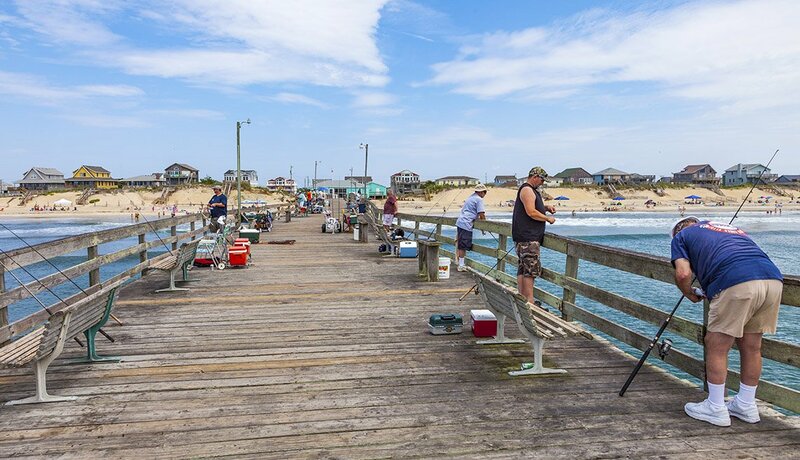 These low-rise beach resort towns run consecutively north to south along the slender thread of sand known as North Carolina’s Outer Banks. The barefoot ambience extends to the towns’ casual eateries, cedar-shake cottages and old-fashioned motor inns. With miles of beautiful public beaches — not to mention the untrammeled Cape Hatteras National Seashore a little farther south — and restorative salt breezes, it’s easy to find serene solitude beyond the dunes. 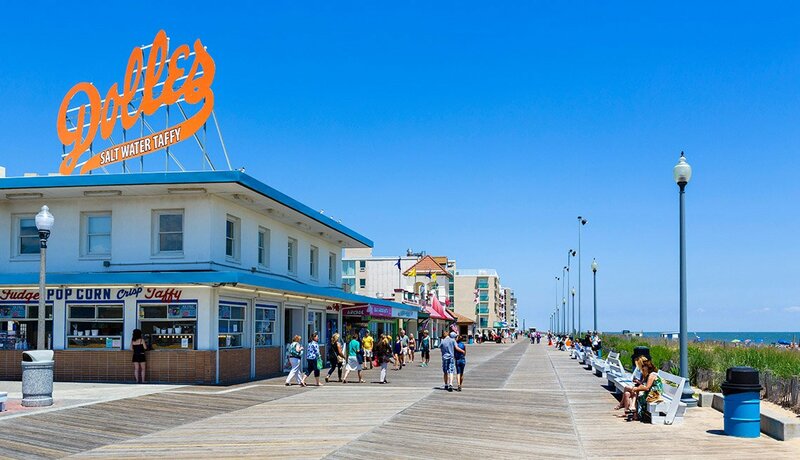 Long a popular family getaway, Rehoboth is the quintessential Atlantic seaboard beach resort town, complete with a mile-long oceanfront boardwalk for twilight promenades. This small, quaint Delaware burg assumes a carnival-by-the-sea fizz in the summertime, with kid-friendly amusement rides, miniature golf and seashell shops. Go clamming, take a pirate cruise, or bike along scenic heritage trails. If you need a little time out of the sun, check out the vintage bathing suits, postcards and other beach memorabilia at the Rehoboth Beach Museum. 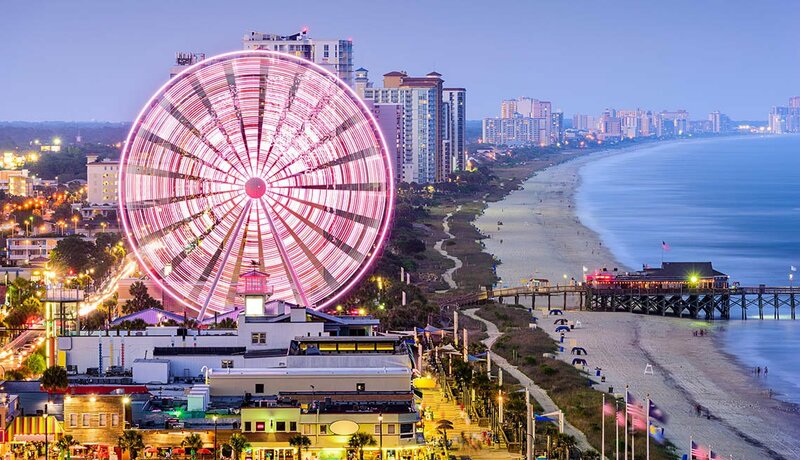 With broad stretches of tawny sand and some 100,000 hotel rooms — most of them in reliably affordable chain hotels — Myrtle Beach is a sunny, casual beach resort town that easily accommodates a range of budgets. 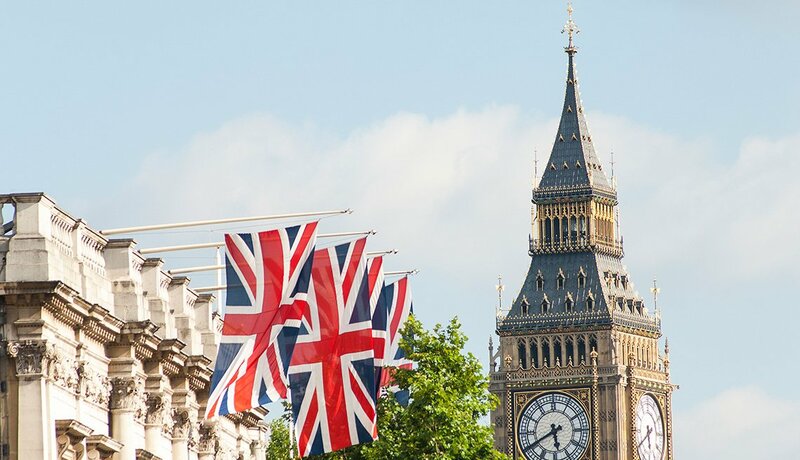 The good value extends to the 300 outlet shops, scores of public golf courses and reasonably priced entertainment—including Broadway at the Beach, where you can do everything from visiting an interactive aquarium to taking in nightly live musical performances. 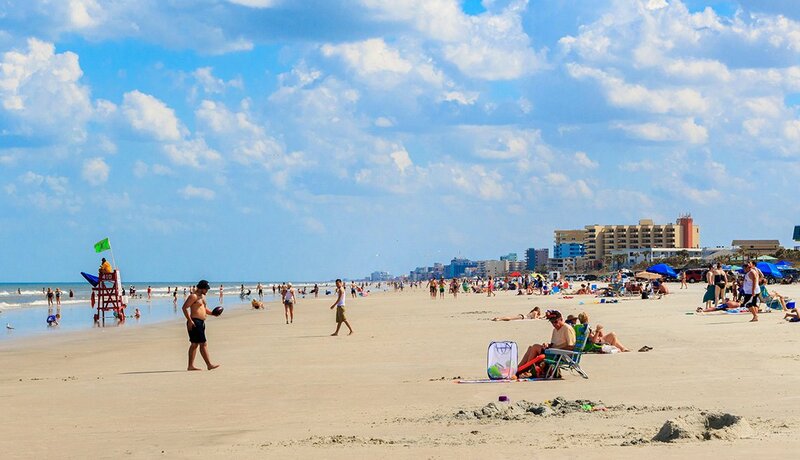 But you don’t need a penny to enjoy the town’s pride and joy: the Grand Strand, some 60 miles of public beachfront lapped by frothy Atlantic surf. Spectacular sunrises reveal smooth Atlantic waters where paddleboarders and kayakers share their mornings with playful dolphins. As waves perfect for swimming and body surfing build over the day, beachgoers emerge from the family-friendly resorts, hotels and cottages that line the wide, drivable beaches to set up camp with canopies, loungers and coolers filled with snacks and drinks. Join in on a game of corn hole; toss a Frisbee; or venture off the beach to explore the quirky shops, restaurants and bars on the main drag — all is within strolling distance. Nostalgic old Florida motels and inns sprinkled along the beachfront are perfect for those looking for an adventure, and a bargain to boot. 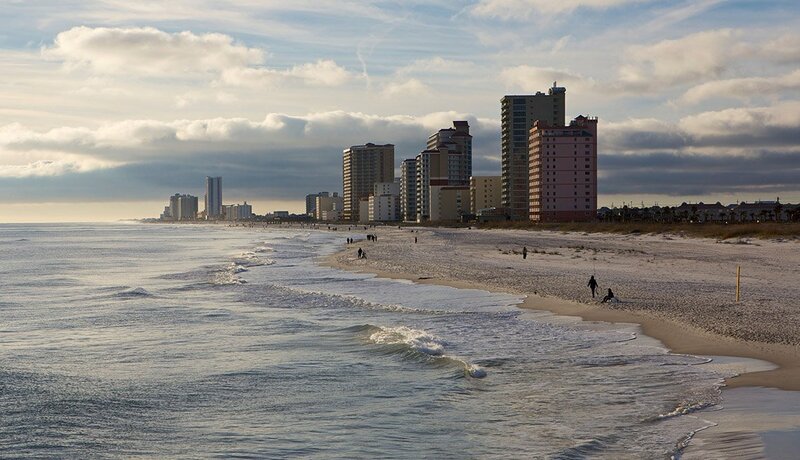 No matter where you stay, the town’s public beaches all offer cool Gulf Coast breezes, calm aquamarine waters and sunsets worthy of applause. 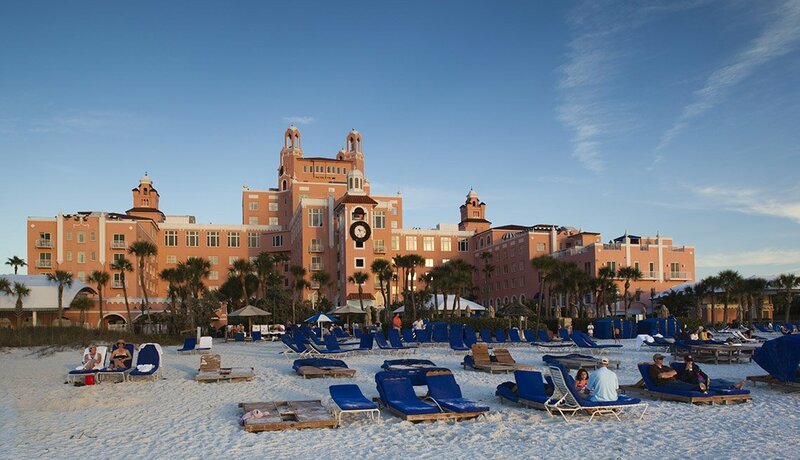 If you want to see how the other half lives, treat yourself to a drink at the seaside bar of the historic Loews Don CeSar, aka the Pink Palace. For a more low-key experience, head to Corey Avenue, where you will find casual dining establishments and funky specialty and gift shops. 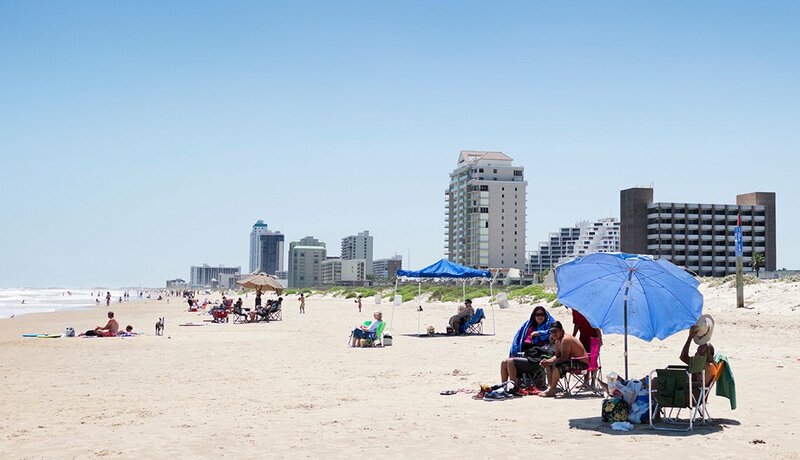 For much of the year, this barrier island on the southern tip of Texas offers a peaceful and relaxed atmosphere where visitors can go deep-sea fishing, birdwatching and golfing — or lounge on the beach with a good book. If that all sounds good to you, just be sure to avoid the brief window during spring break when throngs of students flood the area for some fun in the sun. The island’s Schlitterbahn Waterpark provides a diversion from the beach if you have kids in tow. If you prefer a less pricey and more laid-back activity, take a stroll on the free Laguna Madre Nature Trail, where more than 300 species of birds make their home at different times of the year — you may even spot an alligator or two. Small-town charm draws crowds of visitors to this popular vacation spot on the Oregon coast, where stunning seaside views feature massive stone monoliths that rise from the surf. Although some argue that the area is becoming more upscale, there are still budget-friendly hotels — and the public beach, with 44 access points, is always free. 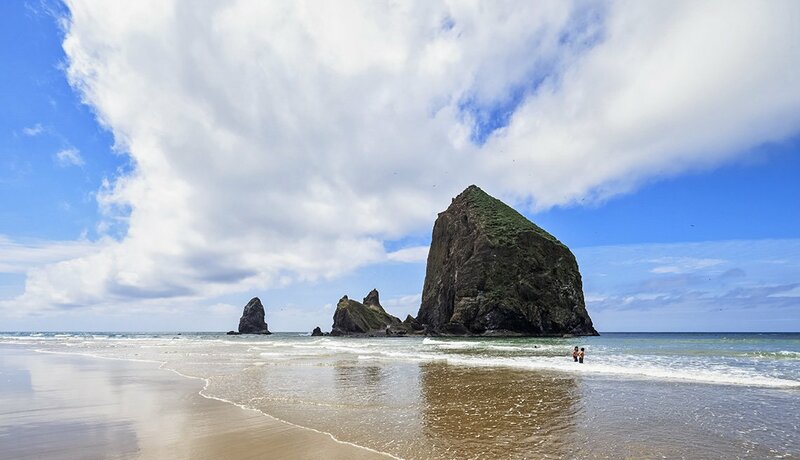 Make your way to the most famous of the sea monoliths, Haystack Rock, part of Oregon Islands National Wildlife Refuge. The rock soars to 235 feet, and at low tide you can walk right up to it to find enchanting tide pool sea creatures, including colorful sea stars, anemone and crabs.